Successfully Added Bluetooth music light bulb-Bluetooth 4.0,Support App,560 Lumens,6500-7000K White Light to your Shopping Cart. With the Bluetooth music light bulb Smart LED bulb, you’ll be able to turn every lamp inside your household into a color light. Capable of displaying over 16 million colors, this LED color light is guaranteed to set the right atmosphere at any occasion. Added to its millions of colors, this Bluetooth music light bulb can furthermore illume regular 6500-7000K white light – allowing you to use it to light your room in the same way as any other light would. Capable of lighting up a 20 square meter room, this RGB color light is the perfect light bulb for in your living room, bedroom, or office. By emitting 560 lumens of bright colorful light, the Bluetooth music light bulb Smart LED bulb is capable of covering any room in your favorite color. Featuring 20 white LEDs ,20 warm LEDs and 5 RGB lights, this LED color light is guaranteed to deliver stunning and bright colors that are sure to set the right mood. With a service life of 5 years, you can surely obtain colorful light and stunning visuals in the following 5 years. 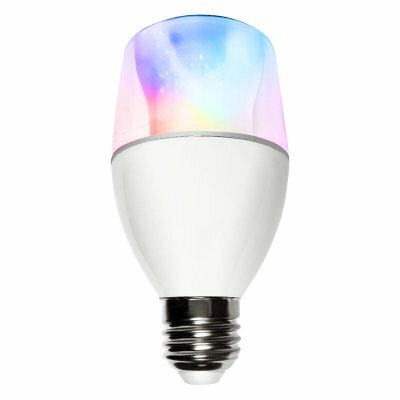 This RGBW smart color light by APP can be controlled via your smartphone, allowing you to easily select and switch in between all the colors of your liking. Additionally, this smart home LED can be either controlled individually via the App allowing you to set forth stunning and synchronized visuals throughout your entire property. With its bright and colorful light, this Xiaomi light bulb is perfect to be used for home lighting, commercial, lighting, studio lighting, or exhibition lighting – making it a truly multifunctional LED bulb. This Bluetooth music light bulb comes with a 12 months warranty, brought to you by the leader in electronic devices as well as wholesale electronic gadgets..
Arabic: - لون الصمام الخفيفة - Chinese Simplified: - LED 的颜色光 - Czech: - Barva LED světla - Danish: - LED farve lys - Dutch: - LED-kleur licht - French: - Lumière LED couleur - German: - LED-Farblicht - Hebrew: - אור LED צבע - Hindi: - एलईडी रंग प्रकाश - Italian: - Colore del LED luce - Japanese: - LED 色光 - Korean: - LED 색깔 빛 - Malay: - Lampu LED warna - Norwegian Bokmål: - LED-farge lys - Romanian: - Lumina LED Color - Russian: - Цветной светодиодный свет - Spanish: - Luz LED Color - Thai: - แสงไฟ LED สี - Turkish: - LED renk ışık - Vietnamese: - Ánh sáng LED màu.